Lake effect snow results from the interaction between cold air passing over warmer lake water generating snow that is deposited in localized regions downwind from the lake. 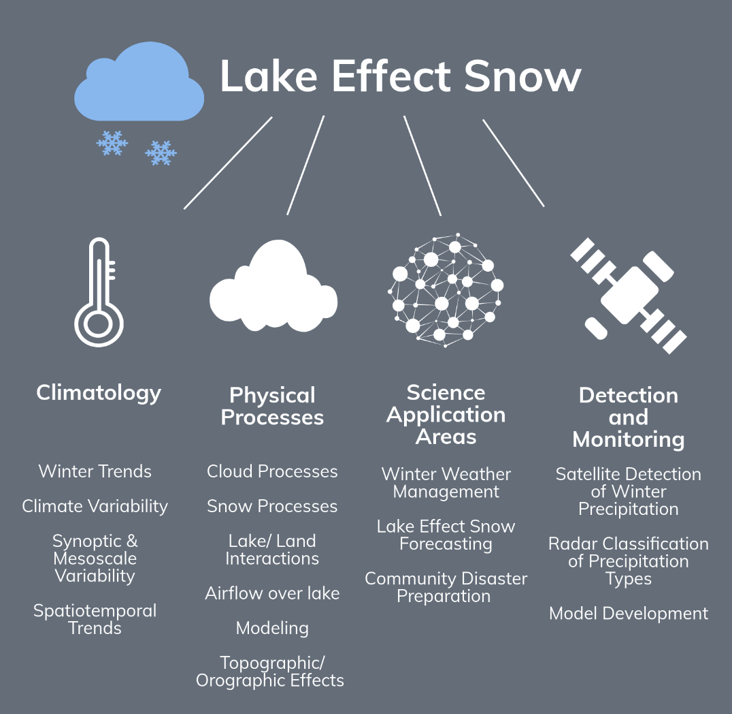 Lake effect snow usually occurs during the late fall and winter months and is capable of producing as much as 2-3 inches of snow an hour with event totals ranging from 60-100 inches. Extreme events are often highly localized, such as the Buffalo, NY event that occurred in November 2014 (NWS, Niziol et al. 1995). This same phenomenon also occurs over other water bodies such as bays and seas where it is called bay effect and sea effect snow. Why does lake effect snow occur? When cold, dry air moves across large areas of warmer water, the cold air near the surface warms and begins to take on moisture from the lake. Due to differences between the colder air aloft and warmer air near the surface, instability causes water molecules to rise upwards, condense and eventually form clouds. The water molecules in these clouds freeze and are eventually deposited downwind, on the leeward side of these lakes as snow and other types of winter precipitation. Lake effect snow occurrence and location is mainly dependent on wind (speed and direction) and topography. For instance, wind direction and speed can affect how narrow or wide a snow band is, as well as its length; whereas topography can influence snowfall rate. 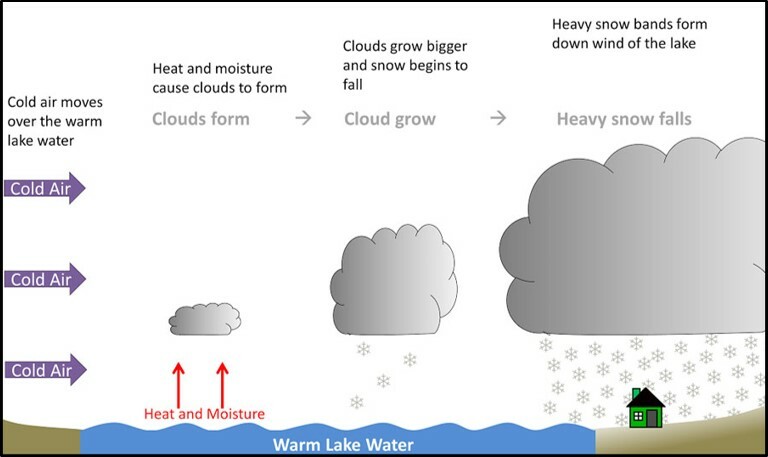 Where does lake effect snow occur? 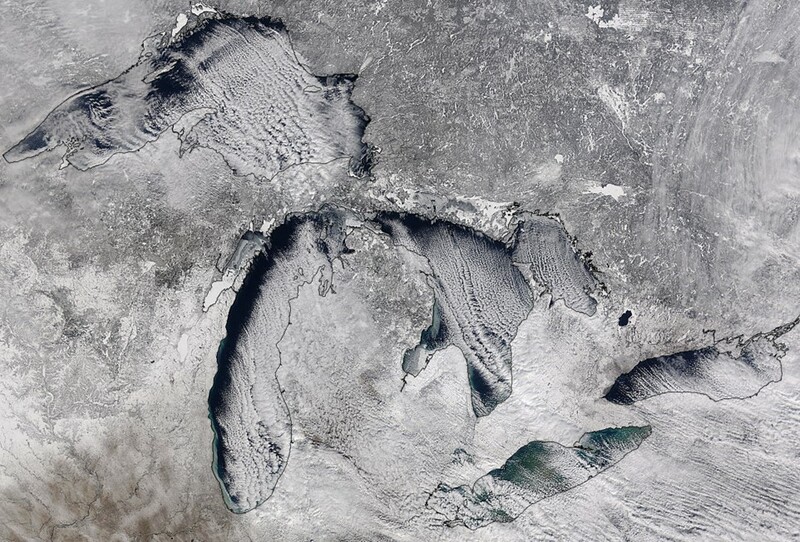 The term “lake effect snow” was first used to describe the snow events of the North American Great Lakes Region in the Unites States and Canada, where lake effect snow occurs to the leeward (downwind) side of each lake. Lake Erie is the only lake that routinely freezes each winter, and once it does, lake effect snow seldom occurs. In the U.S. lake effect snow commonly occurs across northern Wisconsin, western Michigan, northwestern New York, northwestern Pennsylvania and the Great Salt Lake in Utah. HOW IS LAKE EFFECT SNOW OBSERVED? Instruments installed aboard satellites, aircraft and positioned on the ground are used during scientific research projects to monitor, measure and better understand lake effect snow processes. Satellite observations are used to examine cloud motion, extent, content and snow cover. Whereas ground-based and aircraft observations provide more details about the precipitation characteristics, processes and amounts of snowfall. Many of the satellite and aircraft instruments rely on remote sensing, which employs different wavelengths within the electromagnetic spectrum to monitor, track and retrieve information about lake effect snow events. Visible satellite imagery relies on sunlight reflected from clouds to track and monitor lake effect snow systems during the daytime in order to identify features such as clouds and snow bands. Infrared satellite imagery detects cloud top temperatures, which can be used at night to monitor snow systems. Both satellite and ground-based microwave radiometers can identify clouds that contain snow, map snow cover and determine the water content of snow. Ground-based weather radars help determine where snow/precipitation is occurring and how intense it is falling over different areas. Several other instruments are used to study the size, shape and structure of snow particles (disdrometers, Precipitation Video Imagers and particle probes), snow depth (snow tubes), and the water content (precipitation gauges) of the snow that falls to Earth’s surface. HOW WERE THESE DATA USED? satellite instruments to detect and estimate falling snow using active and passive microwave sensors. Identify areas of snow cover and determine the water content in snow. Burnett, A. W., Kirby, M. E., Mullins, H. T., & Patterson, W. P. (2003). Increasing Great Lake–effect snowfall during the twentieth century: A regional response to global warming?. Journal of Climate, 16(21), 3535-3542, doi: 10.1175/1520-0442(2003)016<3535:IGLSDT>2.0.CO;2. Rodriguez, Y., Kristovich, D.A., and Hjelmfelt, M.R. (2007). Lake-to-Lake Cloud Bands: Frequencies and Locations. Mon. Wea. Rev., 135, 4202–4213, doi: 10.1175/2007MWR1960.1. Skofronick-Jackson, G., Hudak, D., Petersen, W., Nesbitt, S.W., Chandrasekar, V., Durden, S., Gleicher, K.J., Huang, G., Joe, P., Kollias, P., Reed, K.A., Schwaller, M.R., Stewart, R., Tanelli, S., Tokay, A., Wang, J.R., and Wolde, M. (2015). Global Precipitation Measurement Cold Season Precipitation Experiment (GCPEX): For Measurement’s Sake, Let It Snow. Bull. Amer. Meteor. Soc., 96, 1719–1741, doi: 10.1175/BAMS-D-13-00262.1. Carpenter, D.M. (1993). The Lake Effect of the Great Salt Lake: Overview and Forecast Problems. Wea. Forecasting, 8, 181–193, doi: 10.1175/1520-0434(1993)008<0181:TLEOTG>2.0.CO;2. Niziol, T.A., Snyder, W.R., and Waldstreicher, J.S. (1995). Winter Weather Forecasting throughout the Eastern United States. Part IV: Lake Effect Snow. Wea. Forecasting, 10, 61–77, doi: 10.1175/1520-0434(1995)010<0061:WWFTTE>2.0.CO;2. Hjelmfelt, M.R. (1992). Orographic Effects in Simulated Lake-Effect Snowstorms over Lake Michigan. Mon. Wea. Rev., 120, 373–377, doi: 10.1175/1520-0493(1992)120<0373:OEISLE>2.0.CO;2. Kristovich, D.A., Laird, N.F., and Hjelmfelt, M.R. (2003). Convective Evolution across Lake Michigan during a Widespread Lake-Effect Snow Event. Mon. Wea. Rev., 131, 643–655, doi: 10.1175/1520-0493(2003)131<0643:CEALMD>2.0.CO;2. Peace, R.L. and Sykes, R.B. (1966). Mesoscale Study of a Lake Effect Snow Storm. Mon. Wea. Rev., 94, 495–507, doi: 10.1175/1520-0493(1966)094<0495:MSOALE>2.3.CO;2. Welsh, D., Geerts, B., Jing, X., Bergmaier, P.T., Minder, J.R., Steenburgh, W.J., and Campbell, L.S. (2016). Understanding Heavy Lake-Effect Snowfall: The Vertical Structure of Radar Reflectivity in a Deep Snowband over and downwind of Lake Ontario. Mon. Wea. Rev., 144, 4221–4244, doi: 10.1175/MWR-D-16-0057.1. Ballentine, R.J., Stamm, A.J., Chermack, E.E., Byrd, G.P., and Schleede, D. (1998). Mesoscale Model Simulation of the 4–5 January 1995 Lake-Effect Snowstorm. Wea. Forecasting, 13, 893–920, doi: 10.1175/1520-0434(1998)013<0893:MMSOTJ>2.0.CO;2. Hjelmfelt, M.R. (1990). Numerical Study of the Influence of Environmental Conditions on Lake-Effect Snowstorms over Lake Michigan. Mon. Wea. Rev., 118, 138–150, doi: 10.1175/1520-0493(1990)118<0138:NSOTIO>2.0.CO;2. Lavoie, R. L. (1972). A Mesoscale Numerical Model of Lake-Effect Storms. Journal of the atmospheric sciences, 29(6), 1025-1040. doi: 10.1175/1520-0469(1972)029%3C1025:AMNMOL%3E2.0.CO;2. Notaro, M., Bennington, V., and Vavrus, S. (2015). 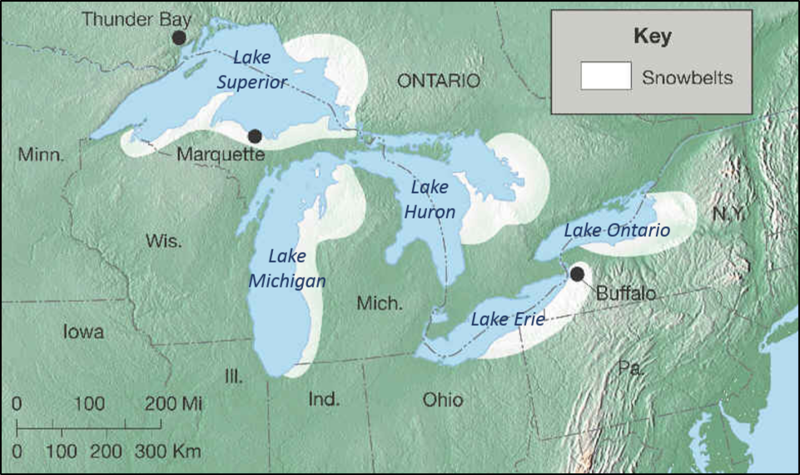 Dynamically Downscaled Projections of Lake-Effect Snow in the Great Lakes Basin. J. Climate, 28, 1661–1684, doi: 10.1175/JCLI-D-14-00467.1.